As women of God, we all struggle with our faith in college, but that doesn’t mean we have to do it alone. 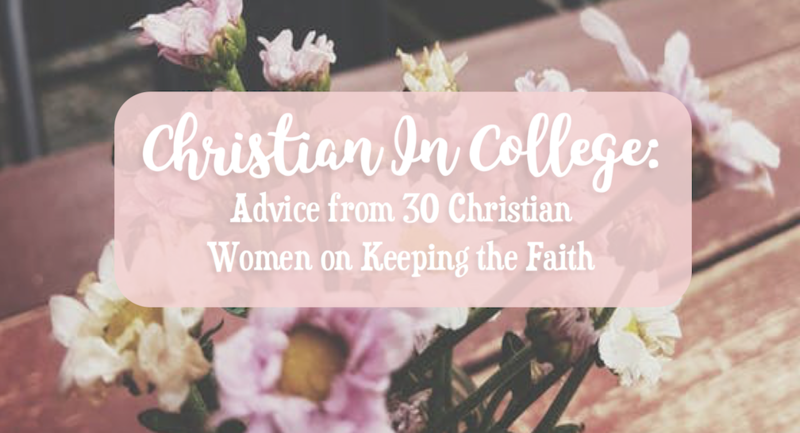 I reached out to over 30 Christian women who are in college, or have been through college, and asked them all about keeping/growing their faith in college. I asked them about how religious they were before and after starting college, as well as their biggest struggles of being Christian in college, and their best advice for not just keeping, but growing your faith in college. Just reading the responses of these incredible women was so inspiring to me, and I hope their words can be an inspiration to you, too. First, I just want to say that these women willingly participated, and this survey is in no way representative of a typical college campus. Most of these ladies were ages 18-22 (current college students), from a wide variety of Christian denominations, and from colleges all across the United States. The ladies named with the quotes in this post agreed to let me share their words with you! 75% of my respondents said they were involved in religious ministry on campus and attended weekly services. These ladies said being involved in religious ministry was a huge part of their continuation and growth in faith in college. Almost everyone agreed that being involved as soon as possible with campus ministry was one of the most important ways to keep the faith alive through the college years. Again, while this sample wasn’t representative in any way, out of the women I talked to, most of them became more involved with their faith in college, or at least attended religious services/activities more frequently than when they first started college. Being a Christian woman in college isn’t easy. We all go through #ChristianGirlProbs, and I was interested to see what these ladies had to say on the topic. When asked about the greatest challenges they faced as a Christian in college, the most popular answers were “balancing life in general, not making faith a priority”, “finding time for personal prayer and reflection”, and “keeping personal faith”. Some of the next biggest challenges were getting involved with church on campus, not having friends of the same faith, and dealing with challenges of faith from others. All these women said they had friends of the same faith, or at least other Christian friends, and most also said they listen to Christian music, at least some of the time. Next, I opened up the questions to let these women speak for themselves, and describe the hardest parts of being a Christian in college. Many of the women talked about how difficult it is to stand strong in faith in a world that can feel overwhelmingly liberal and anti-Christian. Mary-Faith said it’s hard “being very different from most people my age” in terms of not drinking and partying like most people, and this was a common theme with many of the answers. Another common answer was that it’s difficult to make time for your faith in college, when you have so much freedom and so much to do. I love this answer, because not only is faith a personal challenge, we should also be challenged to encourage others in faith, as well! After sharing their biggest challenges of faith in college, I asked them to give me their advice to their younger self, or to fellow Christian women looking to grow their faith in the often critical college environment, and I love their answers. I am so thankful for the participation of these lovely women, and I’m so inspired by their stories! Which piece of advice was your favorite? What advice/challenges would you share from being Christian in college? Got a question you’d like me to answer? Fill out this form! As always, feel free to drop me a comment, or find me on social media! DIY Memory Board: College or Dorm Decor! I read this post for the first time, then read it to my friend, then posted it to my women’s facebook group (the majority of us spent time together on retreat today!) then read it again. This article you created reinforces a lot of topics that were discussed today, and it’s almost like God wanted me to find it. Thank you for taking the time to reach out to these young women and let them know they’re not the only ones facing these fears. God loves you all so very much for being such perfect witnesses! Thank you for compiling such an incredible list of advice! I loved reading through these and realizing how incredible God’s love is!! You’re welcome, Kenzie! I’m glad you enjoyed this post! God is so good! This is so good! Thank you for sharing this Kristen, and thank you to everyone who left such beautiful advice. I’m a Christian in college right now and it is hard! But, like a lot of you mentioned, a group of Christian friends is an excellent support system. Honestly, my friends have really helped me to grow in my faith. I can say with 100% confidence that God has used them to impact my life positively! In addition to being a Christian in college, I’m also a blogger so that’s added difficulty but its so worth it! Once again, I really love this and I’ll keep coming back to it for reference! Thanks for your thoughts, Shante! I totally agree, my friends have helped me so much, & my faith has been such a big part of college already! 🙂 so glad you liked this post!